1 The University of Birmingham, * Project lead, 2 Aberystwyth University, 3 Royal Holloway, University of London, 4 People’s Trust for Endangered Species (PTES), and 5 Worcestershire Biological Records Centre (WBRC). Worcestershire’s natural heritage is the product of centuries of interaction between the natural environment and human land use. The last 50 years have been characterised by a decline in traditional farming methods, posing a threat to landscape and cultural heritage, and to the habitats and diversity of species that have developed in tandem over many centuries. This issue is well illustrated in the production of orchard fruits, for which changing markets have led to traditional orchards being grubbed out and replaced by more economically profitable crops and more commercially viable fruit stock. This decline in traditional orchards is of concern both because of the loss of irreplaceable cultural resources, and the loss of an important habitat akin to wood pasture. One species of conservation concern, and a local Worcestershire speciality, is the Noble Chafer beetle Gnorimus nobilis (Linnaeus, 1758) (01), believed to have declined in abundance and distribution due to its orchard habitat deterioration, habitat loss and, perhaps, fragmentation of habitat. The Leverhulme Trust funded project entitled ‘Integrating ecology and social science in conservation: Orchards, beetles, and agroecology’ started in October 2012, and focuses on the ecology of the Noble Chafer and the management of the traditional orchards with which it is associated. The project partners are the University of Birmingham, Aberystwyth University, Royal Holloway University of London, and the People’s Trust for Endangered Species (PTES), but it has benefited from close collaboration with the Worcestershire Biological Records Centre (WBRC), Worcestershire Wildlife Trust and Vale Landscape Heritage Trust amongst various other groups. As the project title suggests, the project encompasses ecological and social science approaches to the study of the Noble Chafer and traditional orchard management. The simultaneous study of one insect species and its habitat by so many people of varying disciplines is unusual, and a golden opportunity for better understanding the ecology of the Noble Chafer alongside the wider cultural and biological significance of orchards. As with many species in the Worcestershire landscape, the fate of the Noble Chafer is strongly dependent on the management decisions taken by people. So an understanding of the motivation behind, and techniques used for, orchard management across the wide-ranging stakeholders (e.g. conservationists, cider producers, county councils) is essential if such species are to be conserved in the working landscape. 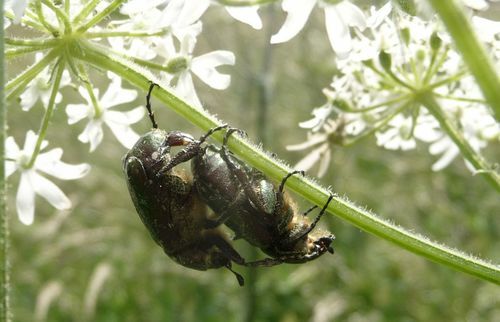 Through informal semi-structured interviews in the county, we will explore the range of attitudes and approaches in orchard management, to better understand why some stakeholders see the conservation of species such as the Noble Chafer as an associated or more important goal than simple productivity maximisation. Much about the ecology of Noble Chafer larvae and adults in and around their main orchard habitat remains relatively poorly known. Thanks to distinctive larval frass (droppings), the recent presence of Noble Chafer in rot holes and other deadwood features can be determined, and this has facilitated the gathering of good knowledge of Noble Chafer distribution in many areas, and can be used to investigate tree and orchard habitat features associated with Noble Chafer occupancy. However, frass could potentially be present in deadwood for some time after Noble Chafer have stopped using the tree, and the presence of frass gives little information about the abundance of larvae in a tree. We are therefore using techniques to identify larval pheromones that will help to monitor larvae without disrupting the deadwood habitat or larvae. Noble Chafer adults are relatively easy to spot when the observer is in the right place at the right time, and can be tagged relatively easily to differentiate individuals. This has allowed us to gather data on the weather conditions and time of day when adults are able to feed and fly. Controls on dispersal and feeding may influence population fitness by determining migration ability and perhaps the fecundity of adults. Being in the right place at the right time tends to require considerable observer effort, and observers cannot be in multiple places at once. Therefore we are developing methods to capture adults using pheromone attractants. This will allow the identification of orchards currently occupied by Noble Chafer and the estimation of the size of populations using capture, mark, release methods. Such detection methods are likely to be particularly useful for Noble Chafer monitoring where populations are patchily distributed and the flight season is quite short. This smaller scale work will be complemented by investigation of the landscape scale variables influencing Noble Chafer distribution using biological records and orchard survey records collected over many years. These records will be incorporated into a geographical information system (GIS) of the region to create data on the amount of coverage of built areas, woodland, and other orchards at a variety of spatial scales. The current distribution of Noble Chafer is very likely to be influenced by the historical distribution of orchards in the region, perhaps representing a kind of ghost of landscapes past. So historical data will be included in the GIS (e.g. 02.) and its influence on current distributions investigated. This historical component also provides a direct link to the strand of the project using molecular genetics approaches. Direct knowledge of the pre-historic distribution and habitat of Noble Chafer before widespread human landscape change is lost. However, following human alteration of the landscape, and before the wide-spread planting of orchards, it seems likely that Noble Chafer (based on the ecology of other Eurasian populations, and sub-fossil beetles found in bog Oaks) used open wood pasture as its primary habitat in the UK. At some point in time the primary habitat choice of this species switched to orchards, which for a relatively brief period (in evolutionary terms) covered large areas of the Worcestershire landscape. The recent loss of orchards has perhaps isolated Noble Chafer habitat to such an extent that adults are now unable to easily disperse between habitat patches. This is likely to have led to the genetic character of different populations becoming distinct, and perhaps even to genetic biodiversity loss resulting from inbreeding. We plan to use modern genetic methods (DNA “fingerprinting”) to reconstruct the species’ past and present ecology and population dynamics. If evidence suggests that between-habitat dispersal is rare, conservation efforts should aim to preserve habitat connectivity in the Worcestershire landscape. If the evidence suggests frequent long-distance dispersal between habitats, then conservation efforts can focus more closely on improving habitat conditions in orchard reserves. Large-scale removal of Noble Chafer individuals for DNA analysis could reduce the fitness of local populations, which would be unacceptable given the conservation importance of this species. So at the start of the project our objective was to develop new methods to obtain Noble Chafer genetic material non-invasively from its distinctive larval frass (droppings), i.e. avoiding mass sampling of living individuals. Remarkably, we found that frass often yields enough DNA to test how genetic diversity of Noble Chafer varies between populations separated by varying distance across the country. However, for some important methods frass-derived DNA is too degraded to use, and so we need to source DNA from adult tissue. Lethal sampling of insects can be controversial, but this project is aiming to be completely ‘no-kill’: small numbers of adults can be taken into captivity from strong populations, used to establish breeding colonies and then removed for genetic analysis only when they die. This procedure will let us study the adults and resulting larvae in captivity to learn more about species biology and ecology, as well as providing stock populations from which reintroductions to the wild can be made if necessary. Investigation of the habitat and landscape variables influencing the distribution of Noble Chafer is only possible thanks to the work of the many people over many years who have gathered records of Noble Chafer frass, larvae and adults, and documented associated habitat characteristics. Such records are, of course, never complete, and there is always scope for people to add to the body of knowledge of the distribution of Noble Chafer and traditional orchards. In particular, there are two ways to help: 1. send records of Noble Chafer frass and adults to the WBRC; and 2. volunteering to survey orchards as part of the PTES traditional orchards survey. The easiest way to detect the presence of Noble Chafer in an orchard is by the discovery of its distinctive frass. Described as being a little like coffee granules, the hard frass of Noble Chafer gathers in rot holes and other crevices of trees that are occupied by the beetle larvae (3. 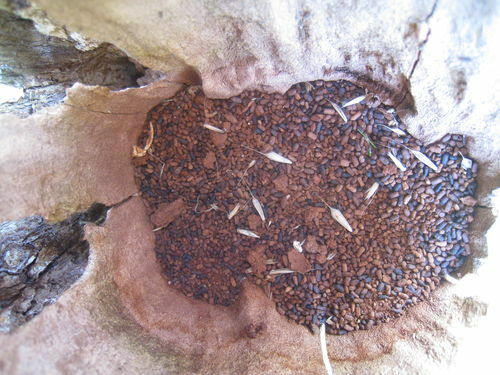 ), and can be sampled from the surface of wood mulch using a long-handled spoon. Samples can be sent to the WBRC for confirmation and some samples are passed on to Aberystwyth University for genetic analysis. Some stages of the Noble Chafer life-cycle, particularly the eggs and pupae, can be damaged by exploration of wood mulch, so gathering larval records is discouraged. Adults are most easily spotted feeding on Common Hogweed Heracleum sphondylium L., Elder Sambucus nigra L., and Meadowsweet Filipendula ulmaria (L.) Maxim. in June, July and early August. Preliminary results from the study suggest that the weather does not have to be warm for this (particularly when close to the host orchard), and that the morning and early afternoon are the best times to see them. Adults can be reliably sexed in the field using two main characteristics: the shape of the meta-tibia (middle leg) (04 & 05) and the presence or absence of a notch on the pygidium (end of abdomen) (06 & 07). The easiest way to remember which is which is to remember that the male is on top during copulation, and uses its characteristic middle legs to help lock onto the back of the female, which fits snugly into the males’ bowed middle legs (08). 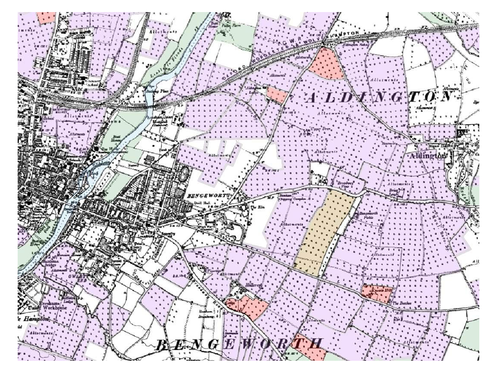 Using a combination of recent and old maps, and aerial photographs, the PTES have created a map of the location and shape of all the likely traditional orchards for the whole of England and Wales. Through lots of volunteer effort, many of these orchards have been ground-truthed and surveyed for habitat character and signs of Noble Chafer. However, many orchards in Worcestershire still need surveying, so every new volunteer is important. People who are interested in volunteering can contact Lauren Alexander at the PTES (www.ptes.org/orchards, lauren.alexander@ptes.org, 020 74984533). What motivations do multiple stakeholders share for management practises that favour Noble Chafer conservation, and how can these motivations be encouraged? What orchard management practises create the most favourable Noble Chafer habitat? How do suitable orchard habitats need to be distributed in the Worcestershire landscape to ensure the continued success of this species? How might different future scenarios of landscape change affect Noble Chafer populations in Worcestershire? The authors would like to thank Worcestershire Wildlife Trust, Vale Landscape Heritage Trust, Natural England, Wyre Forest Study Group, and Cedric and Thelma Qualye for helping to track down and/or providing access to intensive study sites; and the Leverhulme Trust for funding this research. We would also like to thank all the people that have given up their time to provide samples for the study (in particular Jenny Schenke), and participate in semi-structured interviews. This work will hopefully build upon the large body of information gathered on Noble Chafer and orchard ecology by a number of volunteers and investigators over many years. 01. 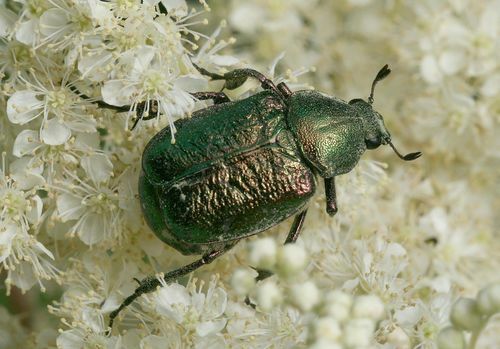 Male Noble Chafer feeding on Meadowsweet Filipendula ulmaria (L.) Maxim., illustrating the distinctive male meta-tibia and lack of notched pygidium, photograph by David Shute. 02. Example distribution map of top fruit orchard cover in 1932. 03. Frass of Noble Chafer larvae in a hollow plum trunk, photograph Adam Bates. Beware, frass is not always as easy as this to find, often there is far less frass than this. 08 Gnorimus nobilis copulating pair underneath a Hogweed flower head. Harry Green.